Resistor network, or array. 4.7k-ohm, bussed, 10-pin SIP. High-failure part in most original Williams System 11 games (1986-1990). 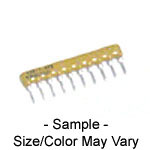 Used in MPU board circuitry for switch matrix, display data/signal lines, solenoid control lines, and similar. Used in many other makes/models of solid-state pinball games as well. Note on resistor/capacitor networks: RC networks are no longer available. If you need to replace an RC network, you can usually do so with only a resistor network (no capacitors in the network). This will work for most pinball applications. Electronic parts not eligible for return- all sales final.